I’m always looking for ways to get more fruits and vegetables into my life – and into my family’s mouths – but sometimes biting into a plain piece of fruit is not that a-peeling. (Haha – I just made a fruit joke!) 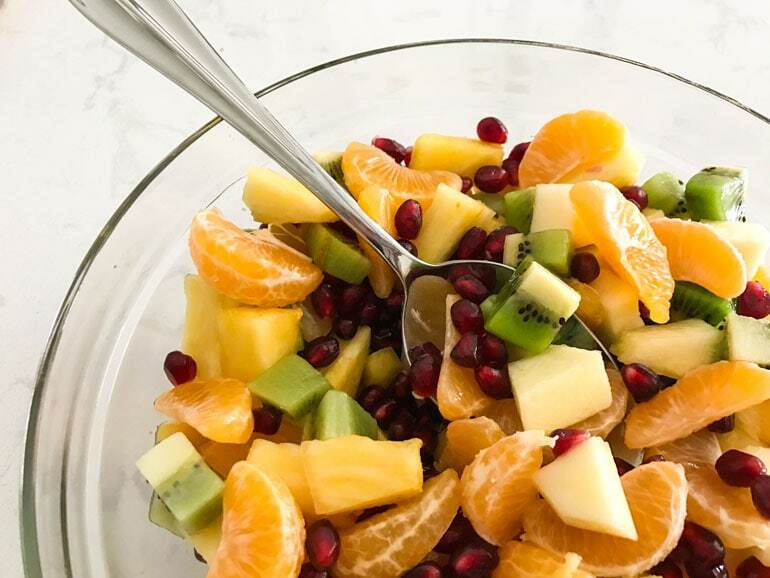 A gorgeous fruit salad is a great way to eat healthy and enjoy it! 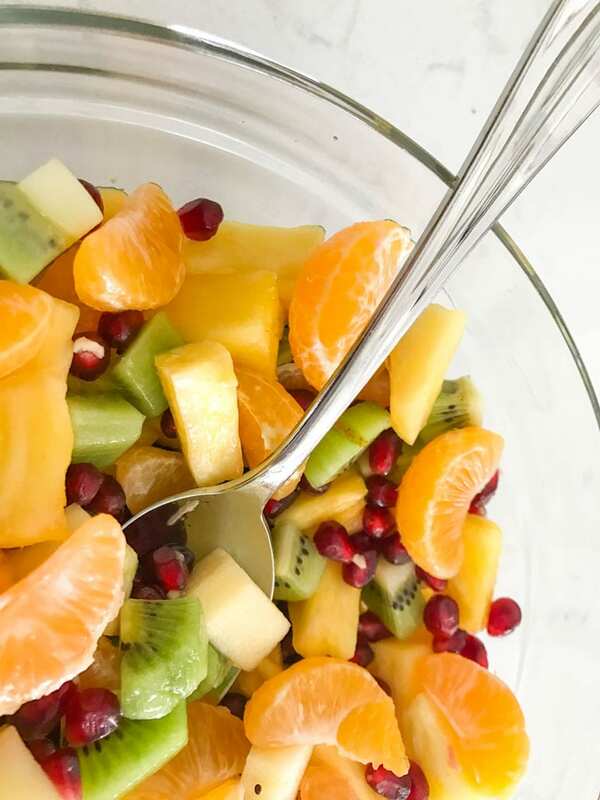 This winter fruit salad combines seasonal citrus, pomegranates, pineapple, kiwi and apples. A simple dressing of lemon and honey adds sweetness and keeps the fruit fresher longer. 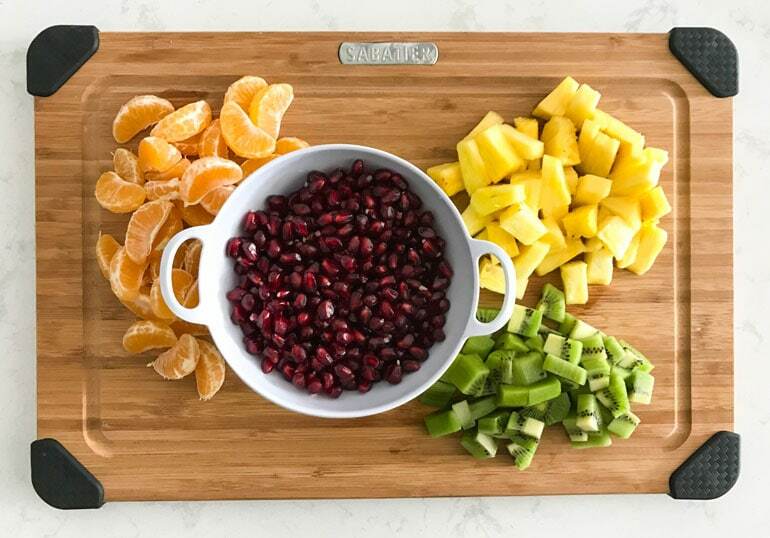 This winter fruit salad is perfect for a holiday party buffet, or you can make a big batch of it and keep it in the fridge. It doesn’t contain delicate fruits like berries or bananas, so it will stay fresh for up to three days. Start your winter fruit salad by combining a little lemon juice and honey in a small bowl or Mason jar, and set that aside. Next, peel and cut up two crisp apples, like Gala or Fuji. Put the apple pieces in a medium salad bowl, and immediately pour on the honey-lemon mixture. The lemon juice in the dressing will keep the apples from browning when exposed to air. Next, cut half a pineapple into small tidbits, and put these on top of the apples. Juices from the pineapple will also help keep the apples crisp and fresh. Cut up the other half of the pineapple as desired and put it aside for another use. The other fruits in this salad are clementines, kiwi and pomegranates. Clementines and kiwi are easy to deal with, but getting the juicy seeds, or arils, out of a pomegranate can be tricky. Check out this blog post by Tori Avey for some good tips. Be patient when separating the pomegranate arils from the tough, white pith. Despite Internet promises that you can deseed a pomegranate in 10 seconds, in my experience it takes about 10 minutes. Put on an apron, listen to some of your favorite music and take your time! Combine all the fruits in the salad bowl and stir until everything is well combined. Make sure the honey-lemon dressing is well distributed. 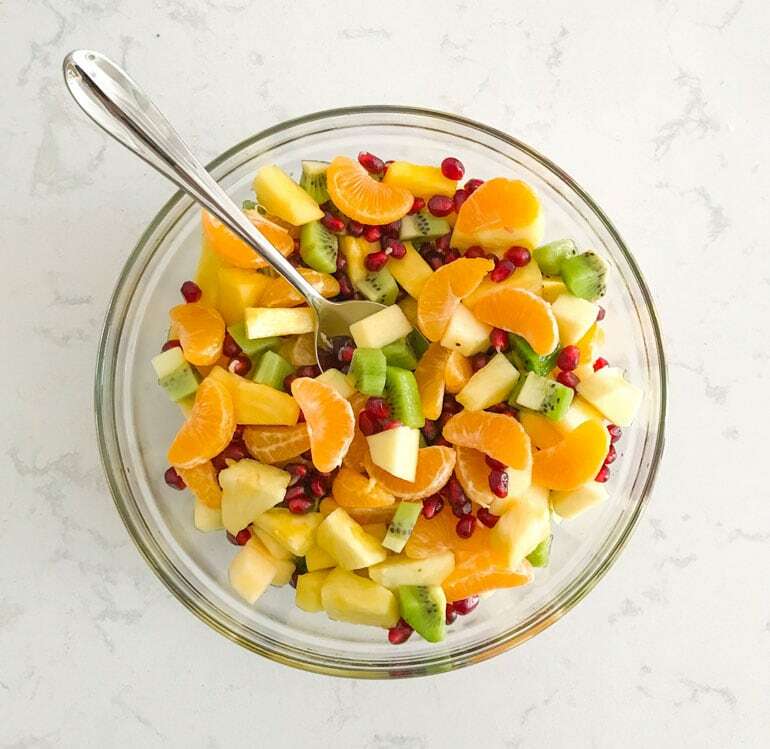 I adore the bright, fresh flavors of this beautiful winter fruit salad! One of my favorite ways to eat it is with Greek yogurt and some extra honey. 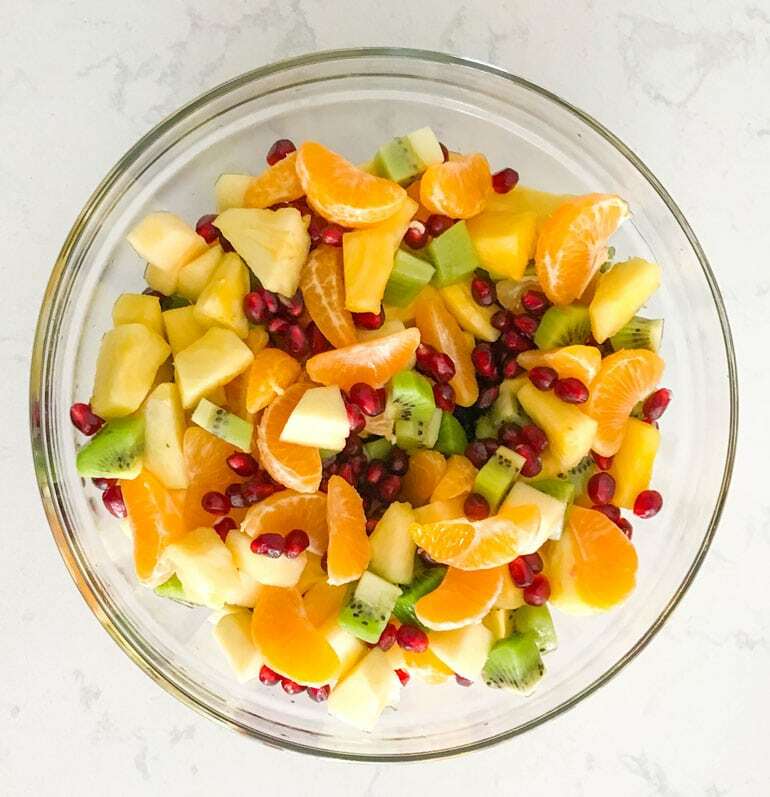 Seasonal citrus, pineapple, kiwi, pomegranates and apples combine with a simple honey-lemon dressing in this gorgeous winter fruit salad. Mix the lemon juice and honey in a cup or small bowl, and set aside. Remove the arils from the pomegranate and set aside. Peel the apples and cut into small chunks. Place the apple chunks in a medium salad bowl, and immediately pour on the lemon-honey mixture. Cut half a pineapple into tidbits. Immediately put the pineapple pieces on top of the apple pieces. Cut the other half of the pineapple as desired and set aside for another use. Peel the clementines and separate into sections. Add these to the salad bowl. Peel the kiwi and cut into chunks of similar size to the other fruits. Add these to the salad bowl. Mix the salad carefully to avoid bruising the fruit. Make sure the honey-lemon mixture is well distributed. If the fruit salad needs sweetening, drizzle with a bit more honey. This was a hit with our family. Thanks for another great recipe. Thank you, Kris! I’m glad you liked it!